For Sale. One previous owner. "Oh no, the head casket has blown!" The lad actually passed a car on the motorway ,while he was in the slow lane. He got done for undertaking. "Where did you get that from John?" "My dad, he dug it up from somewhere." "Brakes? I don't need brakes. I can stop dead any time I like." Michael Parkinson's relatives decide to spend the Sun Life lump sum on a family holiday. 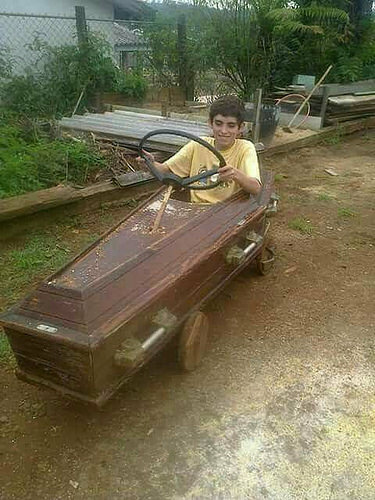 He crashed shortly after when he couldn't stop coffin. Trouble is , he had no where to park it. Which gave him grave concerns. John didn't want to be late for his own funeral. Keeping Death on the road. On the way to the pub for a bier. And he's off...to the Promised Land. "I asked my dad to fix up my go cart. He said am not coffin up for that." "I'm going for a service." Well, it just saves so much time, doesn’t it? He's just off to the body shop to have it sprayed (with disinfectant). Coop: Putting the 'fun' into funerals.